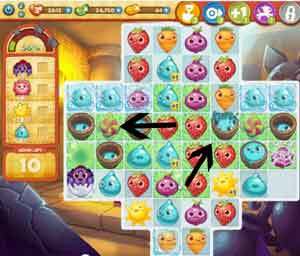 These Farm Heroes level 473 cheats and tips will help you beat level 473 of Farm Heroes. The objective of Farm Heroes level 473 is to collect 1 spider, 4 flowers, 60 suns, and 40 water droplets in 22 moves. To start the level, the bottom and top half of the board will be covered in ice blocks. You will need to remove the cropsies from the ice blocks in order to meet the objectives. Once the ice has been broken down, you will be able to look to achieve the other objectives. Use the shovel booster on the ice blocks if necessary. Look to make matches next to the flowers to start opening them up. The flowers on the inside, center of the board will be easier to collect rather than the ones that are stuck in between the water buckets. Continue to keep your eyes open for a possible opportunity to make a match next to the hard to reach flowers. Look to fill up the water buckets as well. 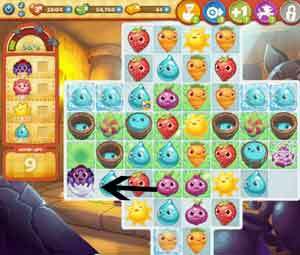 You will need to get more water droplets on the board if you want to meet the objective of collecting 40 water droplets. 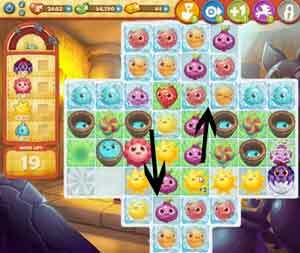 Water droplets will also help you to get rid of any remaining ice blocks and flowers. Level 473 Cheat #3: Work on the spider. The spider will jump from web to web in this level. Look to destroy his web on the right side of the board where he starts first. Once he jumps over to the other web, look to make a match when possible. Since his webs are in the corner of the board, it may take a few moves to get a match to clear him.